Case Study: Boosting Efficiency in a Natural Gas Flow Application | TALON Technical Sales, Inc. The end user is a natural gas transportation and storage service provider in the USA with a natural gas storage well flow application. The customer's primary concern when considering a system upgrade was to track flow rate and display the rate locally. The plant contains 180 Class I, Div 2 hazardous area stations in total. The locations are spread out over a five-mile radius and are controlled and monitored from a single control room. The system turnaround was completed over three years. Prior to the system turnaround, technicians doing daily routine maintenance would have to check the flow rates at each station before performing their work. This process could be very time-intensive due to the lack of a local display. 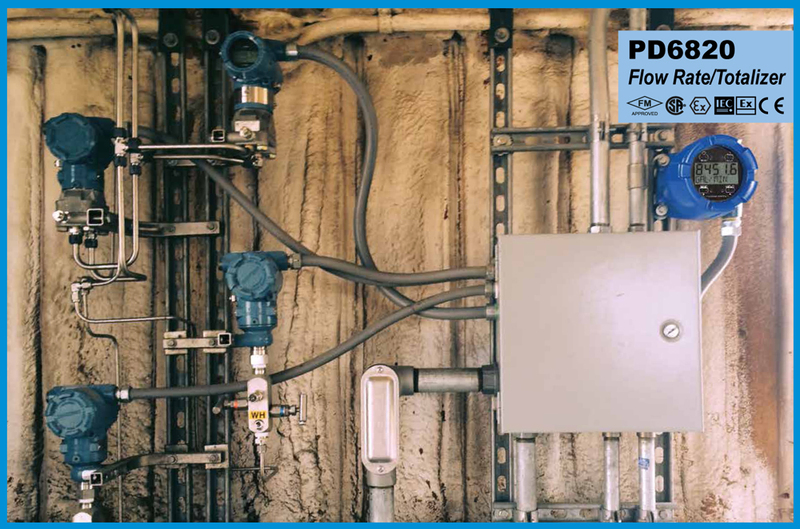 The operator would have to call the control room from a declassified area to find out the flow rate at the station location, then return to the classified area to make the necessary valve adjustments to obtain the desired flow rate. In the installation photo below, there are two sets of transmitters per station location. Two are differential pressure transmitters and two are line pressure transmitters. The V-cone flowmeters use differential pressure to measure flow rates. Mass flow is measured with temperature, pressure, and differential pressure being the primary variables. On the low end, the pressure measured represents a quarter-inch water column, while on the high end there is a 500-inch water column representation. This wide range necessitates the additional transmitters. The transmitters collect the information on pressure, differential pressure, and temperature and send it to a PLC within the locked metal enclosure pictured in the photo. Once the PLC gathers the information, the signal is then split into two separate signals, one branch of which goes to the control room. The other, a 4-20 mA signal branch, routes out to the Precision Digital PD6820 Flow Rate/ Totalizer, located in close proximity to the PLC. Now, since the PD6820 displays the flow rate locally, there are no more extended calls to the control room to seek or verify flow rate. Plant operators like the PD6820's easy-to-read display, its custom units & tags, and that it works with all differential pressure transmitters. Plus, with this system upgrade, making adjustments to the flow rate is as simple as pushing a button. The customer could not quantify the monetary savings of this installation. However, he relayed that the local display saved significant man-hours by making critical information instantly accessible. Explosion-proof PD6820 meters are agency-approved for use in a natural gas environment or other hazardous area. Features such as SafeTouch® thru-window buttons promote safety by eliminating the need to remove the cover for programming. This system upgrade not only increased the company's overall efficiency, but instituted an additional level of safety that both plant operators and management value.